Sam Evans Brown's NPRNH Outside/In podcast, Leave it to Beavers, just aired. For many, it was entertaining, but I was disappointed. Oh, it's not that Sam wasn't engaging, charming, and amusing. Rather, it was because of the way the information was edited and presented was not what I expected from NPR. You might expect that kind of common to be coming from a beaver lover, but that's not the perspective from which I am writing. My observations are as someone who was posting online in 1980, long before the blogging was a word, and someone who spent 25 years teaching people about educational technology integration and effective online communication, including blogging, podcasts, vlogs, wikis, web sites, digital story telling, propaganda, advertising and so on. So you see, I know a few things about the editing process and telling a story, but was also interviewed for the podcast. So I know what I said, the context in which it was said, and what ended up on the editing floor. So with apologies, to Liam Neeson, I do have are a very particular set of skills. Skills I have acquired over a very long career. But don't worry, I'm not going to track down or kill anyone, and I'm not going to rant and rave. I will however, point out how I think Sam unintentionally set a trap for himself that resulted in what should have been a balanced presentation, turning into a distinctly unbalanced one. In his introduction, Sam tells us, "Humans and beavers have a long history together because they like to live in the same places, but the way we've built our infrastructure has almost guaranteed our two species will be locked in eternal conflict. We have created a trap for ourselves. A trap that ensures that we will come into conflict with nature’s most industrious rodent." He then goes on to introduce Carol Leonard of Maine, who wanted to build her dream house, but beavers on her property had other plans for the land. I thought that was a great introduction to what was going to be a thoughtful and informative discussion of how we can resolve that kind of conflict, but it turns out I was wrong, and ironically, I think think this is where Same unknowingly set a trap for himself. Up next, is a short Beaver 101 course and some history of how we wore them on our heads, nearly wiped them off the face of the continent, built over their habits, and then brought them back, because they are good for the ecosystem and because some of us enjoy hunting them. This is where some of the disappointment begins. There are inaccuracies that one could argue, have little or no bearing on resolving conflict though co-existence, but none-the-less, they are inaccuracies, and I'm going to nit-picking facts in this blog. Others have done that and if you are interested, you can check out Heidi Perryman's response to the podcast, along with her fact checking. I'll warn you in advance. Point a fan at the monitor. Otherwise, your monitor might burst into flames. Heidi was considerably more upset than I. Next we move to Pat Tate, of NH Fish and Game, who make a case for why we have to trap and kill beavers, because of the carrying capacity of the ecosystem and killing some beavers is good for other beavers. Whether I agree or disagree is not as important as the fact that we are now 17 minutes into the podcast and still haven't talked about resolving conflict through co-existence. We're ecosystem carrying capacity and beavers in conflict with other beavers. I think its off topic. Eventually, Sam begins to speak with Skip Lisle. Skip is the nations top expert on co-existing with beavers. He has designed and installed thousands of flow control devices, has studies and statistics that prove they work amazingly well, are cost effective, and beneficial the ecosystem, but wait! Sam introduces us to Skip, only for a short rebuttal of Pat's opinion. Here's a time-lapse of Mike Callahan of BeaverSolutions.com, building and installing a pond leveling flow control device on our pond two years ago. It took 3 hours from beginning to end and has been working perfectly with zero maintenance. That brings us to Sam's visit to Sherwood Glen. Again, I won't nit pick. Let's just say that Sam misunderstood my position on trapping. Sure, I don't like it, but I'm not anti-trapping. However, I am dead set against killing beavers out of convenience. 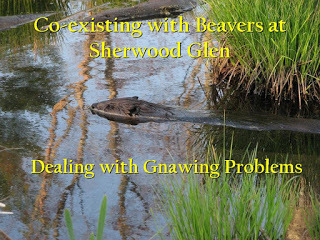 What we did here at Sherwood Glen had absolutely NOTHING to do with the morality of trapping, carrying capacity, or helping beavers who are bullied by other beavers. We did this as a community, for the community, the ecosystem, and the birds and wildlife they support. We had a conflict, we studied, contacted experts, discussed solutions, and decided co-existing would be a win-win situation. We did it because of what they do FOR us, not what they do TO us. Here's a presentation that will give you a better idea of what we did and why we did it. The success, effectiveness, and benefits to the ecosystem were most important factors in determining a solution to our conflict. We did it right and it worked the first time. That was six years ago. I think that's important to mention when discussing how to co-exist. Unfortunately, our reasons for choosing that path and the success we achieved are not part of the podcast. That is a disappointment. All of what I have said so far is predicated on my belief that NPR holds itself to a higher standard of information than typical commercial programming, and that when a social issue or controversial topic is covered, the information is balanced and fair. If I'm wrong in this, then in the words of Emily Latella, "Never mind..." On the other hand, if I'm correct, let's finish up with the evaluation. I don't think Sam was successful at achieving a balance between entertainment and journalism. It's something he addresses in Episode 35 of Outside/In, where he talks about faking scenes in nature documentaries. Sam says, "But nature documentaries, rooted in science as they may appear, are not bound by the same ethical considerations that science or journalism are." I believe the science and journalism aspects of Leave it to Beavers, suffered at the expense of entertainment. Now there's nothing fake in the podcast, but there is one technique Sam used that compounded the omissions and inaccuracies. It started at the very beginning with the introduction of Carol Leonard story and the choice to end with her. It was a good choice from an entertainment and engagement standpoint, but a poor one in terms of balance and what the conclusion of a podcast should do. The conclusion of the podcast, blog, or any story should tie everything together. By starting and ending with Carol, everything in between becomes part of her story. While I respect her feelings about trapping and hunting, terms of co-existing with beavers, her efforts to co-exist were an epic failure. If Sam had chosen to tell Carol's story of a seven-year failure, and opposed it with our six years of success, a different picture would have been presented to the listeners. In the introduction she says, “For seven years I said, you can’t kill them, you have to outwit them,” I can point to thousands of examples where they WERE outwitted, on the first attempt, had Sam included Skip or I making that point, it would have achieved some balance, but instead it planted a seed in the listener's mind that you can't outwith them and you can't win. That seed bears fruit in the conclusion. She goes on to say, “In my naivete, I said oh well we’ll try these beaver deceivers and these beaver bafflers and all these do-hickers,” and that the beaver carried off and hid the last one she tried. To this, Sam adds that Skip would say she did it wrong. I'm sorry, Sam, that disclaimer is worse than fine print. You saw what works and why it works. Only a family of 400 pound beavers would be able to move our culvert protection or pond leveler. Another point that needed to be made, and that would have achieved some sort of balance is the fact that what Carol did would be the equivalent of a trapper spending 7 years trying to kill a beaver with a mousetrap. If you want to trap a beaver, either bring in a pro or get the information and equipment you need to do it right the first time. If you want to co-exist with beavers, you call a pro or get the information and equipment need to do it right the first time. We did and our community and ecosystem are reaping the benefits. This blog, I'm sorry to say, is not a story of how, why, or if we should co-exist with beavers. The message conveyed to the listener, in the words of Heidi Perryman was, "If you can't beat 'em, eat 'em." 4/17/2017 ADDENDUM - This morning, Laura Knoy did a live follow up on to Leave it to Beavers, on her NPRNH show, The Exchange. The show was, in my opinion, much more balanced. Had it aired with or immediately following the podcast, this blog might have been different. Then again, if Carol Leonard had contacted Skip Lisle when she encountered her problem, her story and Sam's podcast might have been different. 4/20/2017 ADDENDUM - Every cloud has a silver lining. As I pointed out in my blog, I think one or two key points I made when Sam visited me, were left out. My displeasure and that of other "beaver believers" resulted in a bit of friction. The interview follow up on The Exchange the following Monday, went a long way to smooth over concerns. The sliver lining here is that in this case, the controversy wasn't necessarily a bad thing. I think it ultimately resulted in my message is getting out. My Sherwood Glen Beaver blog and the time-lapse video of the pond leveler installation have both seen bumps in readership and viewers. If I was still teaching college courses in online communication, this whole situation would have made for a dynamite two weeks worth of lessons. I just got off the phone with Sam, where we discuss all of the above and considerably more. Our conversation was cordial, constructive, and productive. I think he's talented and entertaining, and it's a credit to the NPR listeners who are following up by visiting my blog and video to balance things out. All things considered, I think both sides are being seen and the listeners, readers, and viewers a getting all sides of the issues and they can come to their own conclusions. I can't really ask for much more that that.